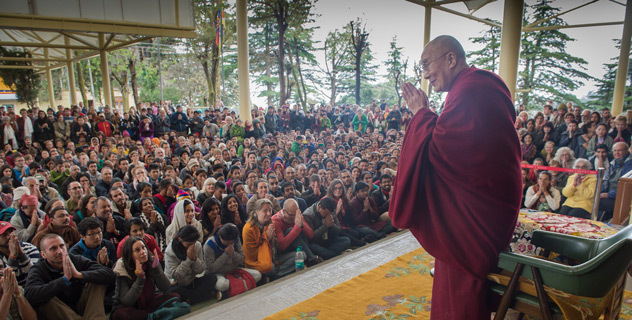 (TibetanReview.net, Apr01, 2015) – Tibet’s exiled spiritual leader, the Dalai Lama, on Mar 30 met with some 1,100 visitors on the courtyard of the Tsuglakhang, the main Buddhist temple in Dharamshala located across his residence. It was one of those meetings the Dalai Lama sometimes uses to interact with visitors to the town from across India and abroad. The crowd at the Mar 30 came from 56 countries in all the continents on the globe, including more than 100 Indians. After addressing the Indian audience particularly, referring to India’s contributions to Tibet’s spiritual knowledge and his admiration for India’s secular tradition, the Dalai Lama spoke about three aspects of religion: as a message of love, compassion, tolerance and contentment which all religions share; as a philosophy on which they all differ; and as a culture which changes over time. And he also spoke about his deep concern for the conservation of Tibet’s culture of peace, non-violence and compassion, which he said were values that could be of benefit to humanity. The Dalai Lama also referred to his three commitments: the promotion of inner values as the source of real happiness, the fostering of inter-religious harmony, and the preservation of Tibet’s language, culture and environment. The Dalai Lama is leaving for Japan on Apr 1 to give religious teachings.